The AARC moved its club station from 5923 Rowan Street, Anchorage in January 2018 to its new location at 6721 Raspberry Road, Anchorage. 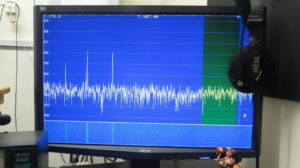 This is the former FCC monitoring station. The facility was vacated by the FCC a number of years ago and the property is now owned/managed by the State of Alaska, Anchorage International Airport Leasing Department. A tentative name for the new facility is the “Radio Science and Operations Center,” or RSOC for short. The building is now undergoing configuration by our members and includes an operations area, full kitchen, training room, meeting room, a business office, a “historical” room, tech shop, 4 full garage bays, and basement storage in part of the building. There is a 45’ AB105 tower on the north side of the building, and we have access to considerable acreage inside and outside of our fenced area for tower and antenna installations. More to follow in the coming months to show our progress on the facility. Following is the information about our OLD club station at 5923 Rowan Street, Anchorage. The AARC Club Station is located at 5923 Rowan Street in Anchorage. 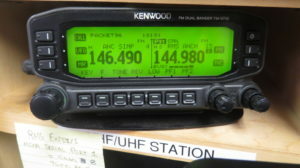 The facility is home to multiple HF transceivers with a wide range of bands and modes, an office area with a satellite station, a workshop area, a single garage bay capable of parking our MTV and Ford pickup, a VHF RMS, MESH nodes, multiple 2 meter, 1.25 meter, and 70cm voice and data stations. 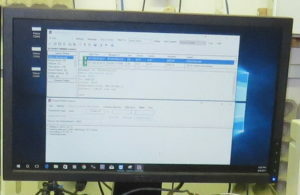 Mobile Internet is provided by a HughesNet satellite station. AARC owns two tower&power trailers are housed outside in a secure area under a weather cover, and multiple antenna systems are installed on the roof of the building or attached to a Rohn 30’ tower attached to the north side of the building. Our main station. 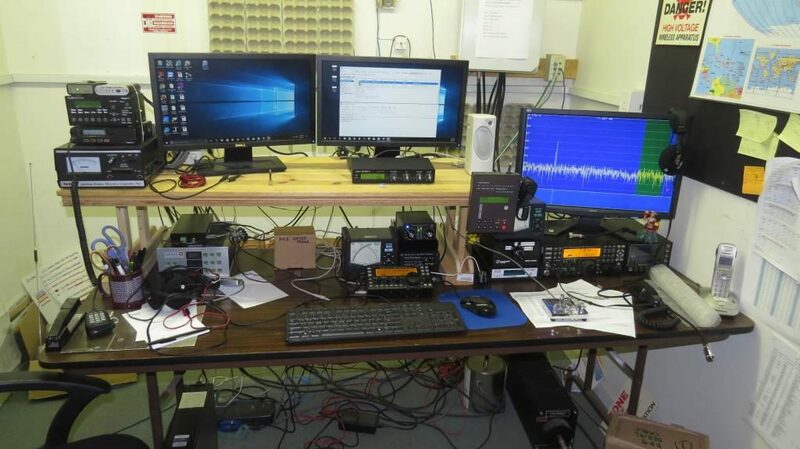 There are two HF (High Frequency) operating positions here (there is also a VHF radio for local communications). 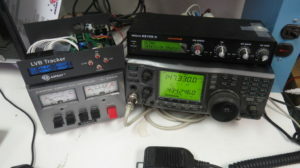 The left side has an Elecraft KX3 transceiver. 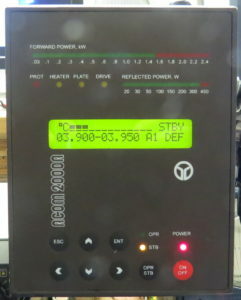 The KX3 is a low power, high quality portable radio. In this location it feeds a 100 watt amplifier. 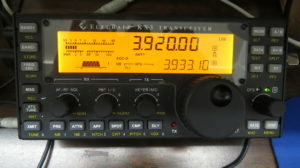 The right side has an Elecraft K3 transceiver. 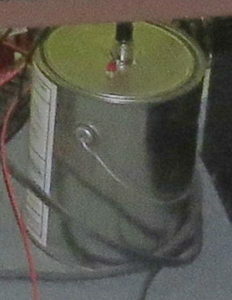 It puts out 100 watts that is fed into an external power amplifier. 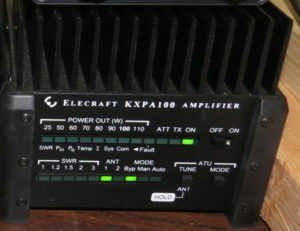 1 – Elecraft KX3 transceiver This is a low power (10 watt) lightweight (1.5 lbs) portable transceiver. 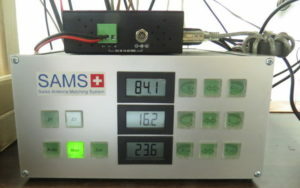 5 – S.A.M.S. 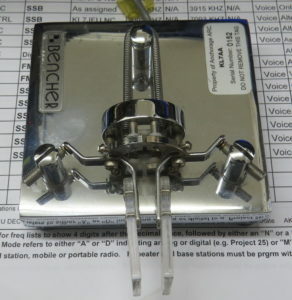 – Swiss Antenna Matching System – A manual antenna tuner. 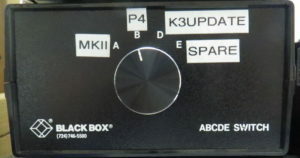 8 – SteppIR FLUIDMOTION Antenna Controller. The SteppIR Antenna has moving elements like a tape measure that move within a hollow tube. 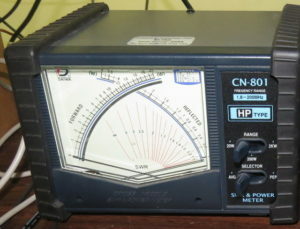 When you change the frequency on the antenna controller, the length of the antenna will change. 9 – The N8LP SteppIR Tuning Relay detects when your SteppIR antenna is actively tuning and blocks your amplifier from inadvertently operating until tuning is complete. Same as #2 on the map. 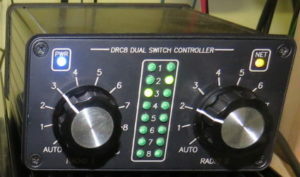 17 – SCS P4 Dragon DR-7800 This is a modem that is used to transfer computer data over HF radio. 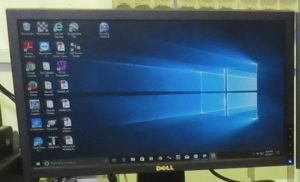 Used for Winlink. 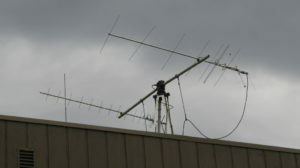 Earth Station KL7AA features the M2 LEO-Pack VHF/UHF antennas that are mounted on a Yaesu G-5500 Az/El rotator, being controlled with an AMSAT LVB tracker and AMSAT SatPC32 tracking software. 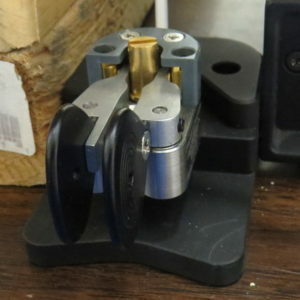 Two SAT capable tx/rx are available: an ICOM 910-H or a Yaesu 847 each with a MicroHAM Microkeyer II for CAT control and Winkeyer CW. 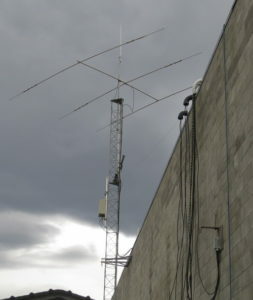 We have a 30 foot Rohn tower with a SteppIR yagi antenna mounted on a rotator, a vertical antenna, along with mesh node antennas. The antenna cables and control cables are routed through PVC elbows to separate them from each other and to protect them from the edge of the roof.